Bookshelves: slightly dusty. My mother would not approve. Eclipse, John Banville: Employing his mastery of the English language to depict an episode in the life of a self-absorbed actor, Banville delivers a piece that is self-consciously a work of art as much as it is a novel. Concerning itself with things occluded and an inability to comprehend the inner workings of the world and the human mind, it allows the reader to marvel at the author’s ability to spin words according to his will, but engagement with the narrator’s life falls by the wayside. A novel so involved with emotions should not perhaps be so cold, but it engages the intellect where it fails to spark the soul, making it an intriguing exercise rather than an absorbing read. Empire of Ivory, Naomi Novik: For the fourth book in her “Temeraire” series, Novik once again sends Captain Will Laurence and his eponymous dragon on their travels, this time to darkest Africa. It’s a more successfully depicted journey than the second book’s trip to China, due largely to a greater sense of threat and urgency, and Novik continues to fill in the corners of her world, providing yet another slant on the notion of a Napoleonic world with dragons. It’s not wholly successful, as the final third of the book is largely detached from what comes before, but as before it’s the strength of the characters and their utterly believable emotional ties and dilemmas that pulls the whole thing through. Victory of Eagles, Naomi Novik: The fifth book in the “Temeraire” series would serve as a surprisingly poignant point of closure, if not for the fact that there’s more of this fascinating world to explore, as the final chapters make clear. Ramping up the action right from the start, Novik for the first time makes the dragon Temeraire an equal point of view character with his captain Will Laurence, and it’s a mostly successful move, even if Laurence’s personal history and reactions to the situations he finds himself in remain the core of the book. Some impressive battles and well-thought out strategy and tactics keep the whole thing moving, but surprisingly, a lack of copy editing in the version I read gave an unpleasant feeling that the whole thing was rushed into publication. Redbreast, Jo Nesbo: A Scandinavian crime thriller that wears its moral message more lightly than Stieg Larsson’s Millennium trilogy, this is an engaging and clever read that only suffers by not being wholly complete in and of itself. Nesbo’s Harry Hole is an appealingly dogged and down-at-heel detective, and the World War II story and aftermath that surrounds his latest case will make it all the more enticing for history buffs. However, the real draw lies in the vivid characters and interesting world that Nesbo has created, as well as the jolts of horrible violence that occasionally intrude on all of them. Invincible beside Walking Dead – good Kirkman ordering of the bookshelf. 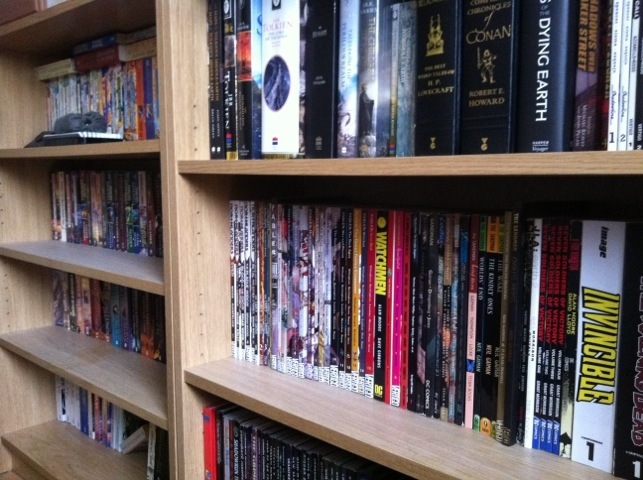 I’ve always been very organised – and I like the big omnibus editions.